GF Ontario Blog: Gluten-Free Licorice!! Oh yes... licorice. Something I know many of you have been missing. Who didn't love the widely available gluten-filled Twizzlers prior to being gluten-free? I had tried some gluten-free vine shaped licorice a long time ago but it just didn't satisty the licorice craving. Nothing about it tasted like licorice... it just vaguely resembled licorice's appearance and not very closely. Then there was the sugar free black cat licorice I picked up at Shoppers Drug Mart in the "No Sugar Added" section... I cautiously ate only one piece to see what it was like. (Sugar alcohols are not my friend. They shouldn't be anyone's friend. They aren't properly digested/absorbed by anyone and can cause gastro symptoms.) Enough ranting... the black cat licorice didn't go over too well. I never liked black licorice anyway. 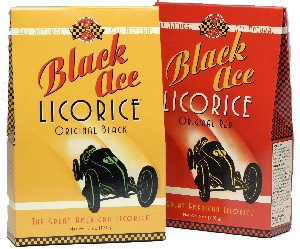 And then I found Black Ace Licorice! Anyway, above is a picture of the box. I've only tried the red ones. I'm sure if you like black licorice, the black would be equally as satisfying. They are shaped like little hockey pucks so you can't bite off the ends and use the licorice as a straw for your juice (wait, was that just me as a kid??). While not exactly like Nibs, it is the best way for me to describe Black Ace Licorice. If you happen to see them in a store, grab them! And I would like to thank the members of my Facebook Group Ontario Celiacs for inspiring today's post ;) Best group on Facebook! I just checked the Black Ace manufacturers website at http://www.naturalcandystore.com/product/black-ace-red-licorice/made-in-usa-candy and am delighted to see that it is no longer produced in a facility that also handles wheat. Great news, Jax! Bar none, the black Black Ace is the very best version of the black licorice I miss so much since my diagnosis. Allen's is good but almost too powerful. Now if only there was an equivalent gluten-free version to the double-salt Dutch licorice. Anyone know if there is? Wow,fascinating information, I would love to try them both and tell which will suit my taste more. Thanks for this! You can also get Black Ace licorice at Dolce & Gourmando (www.dolcegourmando.com). They've got GF saltwater taffy too!